A pool is definitely a nice addition to any home, but why stop there? Once you have the pool of your dreams, it’s time to create an entertainment area that will make you the envy of your neighbors and friends. 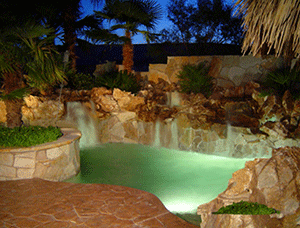 Hawaiian Pools and Waterscapes can help you with such a project. We can help you enhance your backyard or entertainment area and turn it into something truly unique. We can begin with some landscaping to enhance your area’s natural beauty. 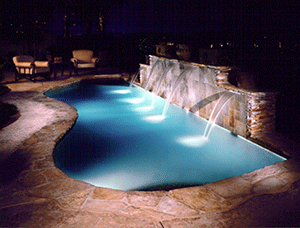 You can add a variety of features to your garden or pool area to make it truly stunning. A sparkling pool can only become more beautiful with the right backdrop, which is what our team of experts can provide for you. After a nice swim or dip to cool off, you can enjoy the wonderful weather by lounging underneath your own patio cover or palapa. Of course, a day of swimming and lounging under the sun can get you hungry. So, why not head over to your custom designed outdoor kitchen and cook up a meal worthy of a Michelin star? When you hire us, this dream can turn into a reality.